The sessions are limited to fourteen students, for three hours plus a half hour prep time. Actors find their scripts from the files I provide in the studio, on their own, or write their own scenes that both challenge them, and keep them age appropriate to their scene partner. The cost is $140 for four sessions, with a $35 refundable deposit. If you miss for any reason, it can be made up by coming to two sessions in one week so you never 'lose' the session. 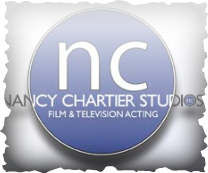 *Please note - you must audit a session before you can join Nancy Chartier Studios; there is no charge for this. Coached/Taped Auditions with Nancy are $75 per hour, $45 for 30 minutes. Text 469-441-6887 for your request.